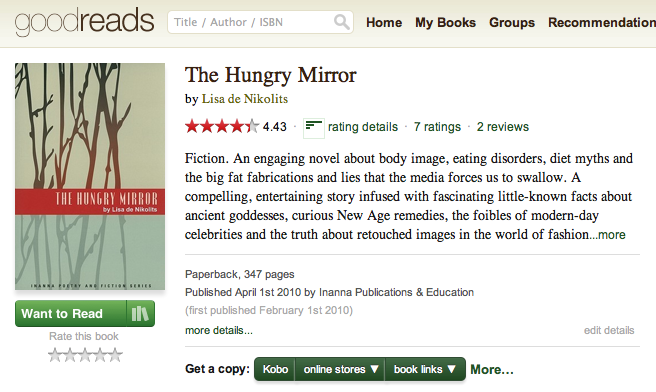 If you ever wondered what it's like to be under the spell of an eating disorder, you need only turn to Lisa de Nikolits' book, The Hungry Mirror. Avoiding honesty with oneself and within all relationships are clearly delineated, as is the way that eating disorder symptoms get used to distract away from dealing with anything real. "No one wants to admit that the promised land of thin is just a myth," says the main character. Recovery, we learn, requires recognizing that "thin rewards" are no where near as satisfying as the promise our mind seduces us into believing. For anyone who has ever wondered why a smart, accomplished woman would starve herself just to feel human, The Hungry Mirror takes an unsentimental look at the lonely world of eating disorders. This gripping tale of fractured self esteem pulls back the curtain on rigid regimens that collapse into chaos over and over again. Played out against a childhood where drastic dieting was a family value, Lisa de Nikolits expertly delivers both sides of "a perfect life" that includes a marriage headed over the cliff and a brilliant but unpredictable career. Fasten your seatbelts, folks; this is a ride on the psychological and emotional rollercoaster that is anorexia and bulimia. Lisa de Nikolits’ novel takes us into the lonely world of disordered eating. It’s a violent book, outlining the punishment that the narrator inflicts on her body as she desperately tries to navigate her feelings about food in a world where beautiful equals thin. Women’s writing has always played an important role in shaping and influencing feminist politics. Contemporary feminism is even more fluid in its boundaries, shifting and changing with the times. The Hungry Mirror (and Porny Stories) reflect the need for new, engaging voices on topics that have long been at the centre of feminist debates. The Hungry Mirror is written in short chapters, almost like journal entries that describe the daily issues of a woman living with disordered eating, how she manages work, friends, a relationship; everything is a negotiation. There are chapters that take us out of this world and discuss, in detail, a conversation with a friend or a day at work—these chapters can feel out of place as de Nikolits jumps into narrative threads that are left unexamined.These disconnected moments, however, make us voyeurs, eager to return to the intimate world of secrets and shame. In this way, we are implicated in the larger discourses critiqued in the novel that keep her spiraling downwards.–Canadian Literature, A Quarterly of Criticism and Review, reviewed by Kim Snowden Snowden, Kim. (Un)Satisfying Hunger . canlit.ca. Canadian Literature, n.d. Web. 10 May 2011. This was not an easy novel to read. It was well-written and engaging, it’s short chapters and first person perspective making it almost journal like in quality. But it’s difficult to reconcile the amount of pain and suffering this woman puts herself through just to maintain some fractured ideal body image. Not that I don’t understand the compunction to be thin, the societal imperative that thinness equals happiness and beauty. It’s just painful to watch someone destroy their body in such a vicious way. Denying oneself not only the value of nutrition but also the pleasure of food itself is utterly cruel. To care so little about yourself that you can do this for years on end… frightening and sad.Lisa de Nikolits cuts right to the bone in writing this novel. She creates a character we can really care about, and goes deeply into the heart of eating disorders in such a way that we cannot ignore them. It behooves all of us who are even the tiniest bit diet-obsessed to read The Hungry Mirror – you’ll never look at your reflection or your dinner in quite the same way again. Anyone who has ever dieted, purged, restricted or counted calories will see some of herself in this raw, candid portrait of an unnamed 30-year-old protagonist who argues with and berate herself to justify every bite or sip. Her eating disorder is enabled by her distant, perfectionist, alcoholic husband and her image-conscious colleagues in the fashion magazine industry. The author's own experience with the industry's dangerously unrealistic expectations lends biting insight into the mind of the narrator. When you've been rewarded for losing weight from the age of 12 and eat steamed vegetables every night for years, how can you see it as anything other than normal? A trigger warning for disordered eating accompanies the recommendation for this book. Lisa de Nikolits' first novel is an unconventional treatment of eating disorders, which are often presented in fiction as merely an adolescent phase. De Nikolits shows how such disorders can in fact continue into adulthood. The sufferer appears fully functioning, while in reality their body obsession permeates every facet of their lives. De Nikolits's beautiful, ambitious narrator has a husband and a great job designing layouts for women's fashion magazines. Beneath this exterior, however, she is anorexic, bulimic and deeply obsessed with body image. Her entire life revolves around her reflection, not least of all her professional life, where she promotes a heroin-chic aesthetic. She subsists on apples and green tea, avoid social situations where there will be buffets, dresses in baggy clothing, and judges her friends and co-workers' physiques, imagining all the while that they're judging hers as well. And perhaps they are: de Nikolits' has embedded the narrative so deeply within her narrator's psyche that it's hard to tell where the neuroses end and the reality begins. Such close proximity to de Nikolits' unnamed narrator makes The Hungry Mirror an uncomfortable read. Part of this is intentional, and effective – it becomes clear that the narrator is a prisoner of an obsession that exhausts her both physically and mentally. However, the novel is undermined by too many ideas that aren't sufficiently integrated into the narrative. The Hungry Mirror is stuffed with references to diet trends, tabloid culture, and statistics about eating disorders and body image. For example, one of the narrator's co-workers announces, "Hey, I want to tell you some figures I found. from Dove. I am going to use them in my screenplay," and then goes on to state that only 2% of women consider themselves beautiful. In some cases, entire chapters are based around such flimsy constructs. Though the novel's conclusion is thoughtful and strong, its narrator is too much of a receptor for these Google-gleaned factoids. “I have a dozen reasons to be tired. Life is just one of them.” From The Hungry Mirror. Check it out, it’s insightful. There are so many sentences I liked in this book. This is just one of many. It’s definitely a good read. 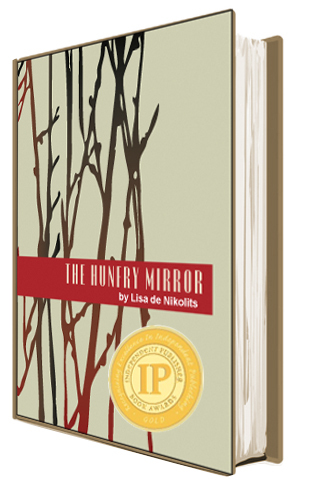 "I read The Hungry Mirror, by Lisa de Nikolits. Readers who enjoy the story told in the first person and present tense would feel as if they were listening to an old pal, especially those who had or still have anorexia and bulimia. This novel is a mirror, which may reflect our own images. From the first few pages of the book, Lisa de Nikolits’ unique and entertaining writing style will have you captured. Her words are so strong and realistic most any reader can resonate with the character and some of her antics. The Hungry Mirror is a witty, captivating, and entertaining read that accurately portrays the reality so many women face; a constant battle with their weight, body image, and food. On top of that she throws in relationship issues we face with friends and partners. With every turn of the page there are realistic accounts of thoughts and actions nearly every one of us have had or know someone who has faced the same mirror. This was a deeply compelling read… A vivid, realistic portrayal that enables the reader to catch a glimpse of life for those who suffer from eating disorders. Beautifully written... Great job Lisa! It really puts a true spin on the complicated dance of an eating disorder...and how it's so often tied into relationships. This is a really important piece of writing. 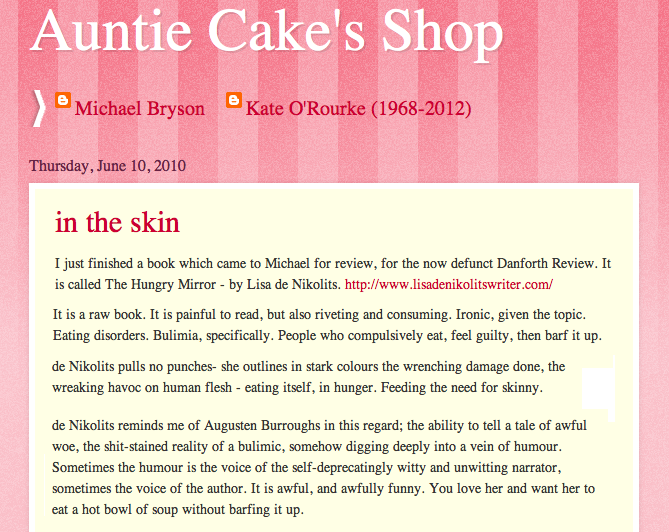 The life of an anorexic-bulimic is communicated so beautifully and with such an incredible vocabulary – it’s riveting how every moment of the character's life is controlled by her illness, and, even more that the writing is able to get her pain across so fully and completely in every single line of prose inside this book. I especially love the insights about celebrities, it's a very good take on that issue. I also really love the line about food being the artist's tool for torment – it sums up everything, really. Congratulations Lisa! You've written a book that needed to be written and you did it with beautiful pain. Eat this book whole. No small bites. It is worth it. “I have been a fat girl ever since I was young. In high school most girls were wearing a 4, I was in a 14. At that time I felt worthless and I didn't like to look at myself in the mirror because it was depressing. There is so much more to being skinny or fat and I will never be the "right size" by the media's standards.If you have ever felt like you weren't good enough for something as trivial as your looks, read this book. While reading this, I felt like the book was my friend. Lisa understood me in a way that I didn't think anyone else could. I felt like this book made it's way into my soul. It touched me in ways I never knew a book could. Lisa rocks! The Hungry Mirror is a rapid paced, comical, yet gut-wrenching look into the hearts, souls and minds of many we may know. who may or may not have an eating disorder. Subtle tragic intricacies are laced with quirky moments, yet it in no way makes light of the disease. It actually brings it home hard. Kudos Miss de Nikolits....and now...what shall I eat? Clever, Captivating and Shocking — A Must Read! In this thoroughly captivating, clever and shocking narrative we witness the struggle of one woman with the isolation and self loathing that constitute an eating disorder. Her deepest moments of darkness are illuminated by Lisa de Nikolits' energetic and quirky writing style, which makes this book impossible to put down. Through a behind-the-scenes look at the magazine publishing world, we are reminded of the way mainstream media has butchered the raw, natural femininity that has been reverenced for thousands of years. Ultimately though, we are reminded of the strength and beauty of a woman's spirit. In sum, this book is a must read. At the least it will be eye opening, but for some it might be life changing. Who would have thought that the devastating inner workings of an eating disorder could be engaging rather than repellent. de Nikolits, through incredible wit, humour and naked revealment pulls you in like Anna-Marie MacDonald – you feel the main character's pain and obsession. Delighfully laced through the story is a 'Devil Wears Prada' type expose that takes you behind the scenes of the frivolous and flighty world of publishing. Brilliant and impossible to put down! From the first page of the first chapter, this book took me in and wouldn't let me go. Every sentence packed a humorous, insightful and frequently devastating punch taking me into a world I didn't know much about and on a journey I won't soon forget. If you're looking to read something beautifully written and telling a story with substance, choose The Hungry Mirror. You won't be disappointed. Through her very engaging and raw inner dialogue the author effectively conveys to the reader the kind of day-to-day struggle someone with an eating disorder wrestles with silently while the rest of the world goes on, oblivious to the intense fears that hover below the surface. While it is a serious commentary on the state of body image today, The Hungry Mirror is also an intriguing portrayal of a smart and funny protagonist. Unlike other novels in this genre that are dark (Skinny) and without hope, de Nikolits shows us someone who is anxious to understand and embrace herself and the strange world around her. As a reader, unintentionally we end up identifying and bonding with our subject. If you are aware of your own inner critic, you will be able to sympathize with the honest declarations of this entrapped addict. The Hungry Mirror takes our hand and invites us to join the author in her characters' tortured daily struggle. Behind every eating disorder, plain and simple is an addiction. The addiction serves the purpose of helping the addict deal with the seamingly unsurmountable trials of day to day life. Through this reading you will offered a first hand view of understanding the pains of any addict. With this gift of understanding, you can promote healing for yourself and others. … I thought I was the one narrating this book. I have always had body image issues, however in 08 I had a gastric bypass and found myself losing 130lbs and feeling wonderful. At the end of it all they really don’t give you the psychological support required for such a drastic change. What I am experiencing now is what the main character is going through. I picked up The Hungry Mirror hoping for some enlightenment and got much more. Lisa de Nikolits is an incredible writer. Vivid and disturbing, it certainly illustrates how soul-destroying and all-encompassing eating disorders are. I found it difficult but compelling reading.–P.M. I enjoyed The Hungry Mirror very much. To be on the 'inside' of someone who has such a debilitating condition and to learn how their mind works was awesome. it gave me a new understanding of how tortured these poor women are. Always to be hungry and to 'punish' themselves by not eating for by eating and then purging. To be totally obsessed with fat and calorie counting and never to enjoy food – it is an alien concept to me but now I have a new outlook on this condition. The novel’s style had me gripped and I was immersed in the story, very quickly. I liked the end and I was hopeful it would be the start of her route back to a healthy lifestyle. 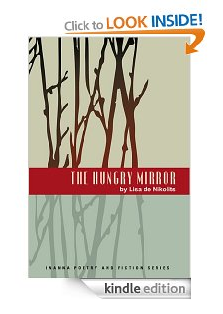 In her novel, The Hungry Mirror, author Lisa De Nikolits enters a world inhabited by those to whom food is a form of cruelty. We get a glimpse of that ethereal world where women starve themselves in order to feel thin. Sometimes it seems that it isn't so much a matter of looking thin or even being thin - but of feeling thin psychology. Eating (or none eating, or throwing up) is a constant head game. As a line in the book says, "How many calories in a gin and tonic?" The novel's main character (we never know her name making her seem even more wraith-like) counts calories by the one's and two's -- not by the hundreds. As a backdrop, the fast paced world of media, advertising and graphic design offers us a troubled, but oddly likeable array of quirky characters. All of whom have problems -- from alcoholism to marriages that are less than ideal. But these problems and relationships, and how they intertwine, weave the fabric of this book in a way that makes the reader hope for a brightly colored new bolt of cloth at the end. De Nikolits offers a glimmer of hope in a world where not consuming can become all-consuming. If you know someone who fights with body image or food issues and you just don’t understand how their brain works but want to? I truly loved this book. So beautifully written. So sad at times, but with so many funny little moments as well. Amazing style and talent. Congratulations and I look forward to reading your next one. 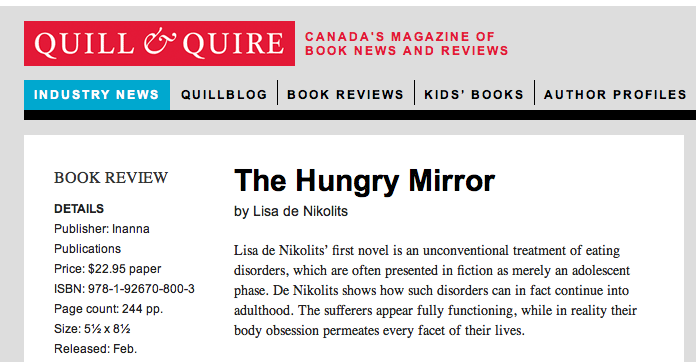 Lisa de Nikolits’ The Hungry Mirror is a first-person narrative about the daily stress of being bulimic. Creeping into every inch of her life—be it her perfect, convenient, loveless marriage, her friends (or the lack thereof), jobs that frequently change, or her struggle to live the lie of having the perfect life—these pages flesh out the protagonist’s constant dread of food. The often two-, three- and four-paged chapters build, for the reader, the panic of someone who lives a life of planning and counting calories to the point of starving herself ahead of letting herself eat a meal in a restaurant. The event that ties up the loose ends for our protagonist is a cathartic “two-day course on body-image, an expressive art workshop” her sister Madison gifts her. Redemption for this high-emotional-quotient novel comes in the form of the last chapter, titled “My happy-ever-after.” This eating disorder is essentially about binging and purging. How does one write an entire novel about it and treat it with sensitivity, while ensuring interest and integrity? I would say like The Hungry Mirror does. 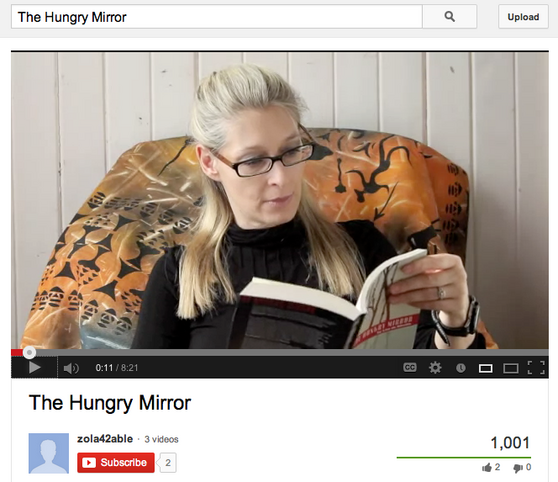 The Hungry Mirror wins a Gold Medal Award for Women's Issues, Fiction. And equally important, it is such a well written and engaging book! !I hope the word about your book continues to grow; the issue it addresses is so important. “Thank you so much for all you did to make last night happen. Although the audience was small, they were obviously very engaged. You were excellent. Your beautiful spirit shone as you shared your book and your experience of becoming a writer. "Meant to tell you, three friends have already finished The Hungry Mirror and they loved it. One kept uploading quotes from it to Facebook via her Kindle and another wrote a review on Amazon.co.uk. They've recommended it to other friends because they loved it so much."